Don’t you just love when someone does something so nice that you get a bit tongue-tied when it comes to thanking them? 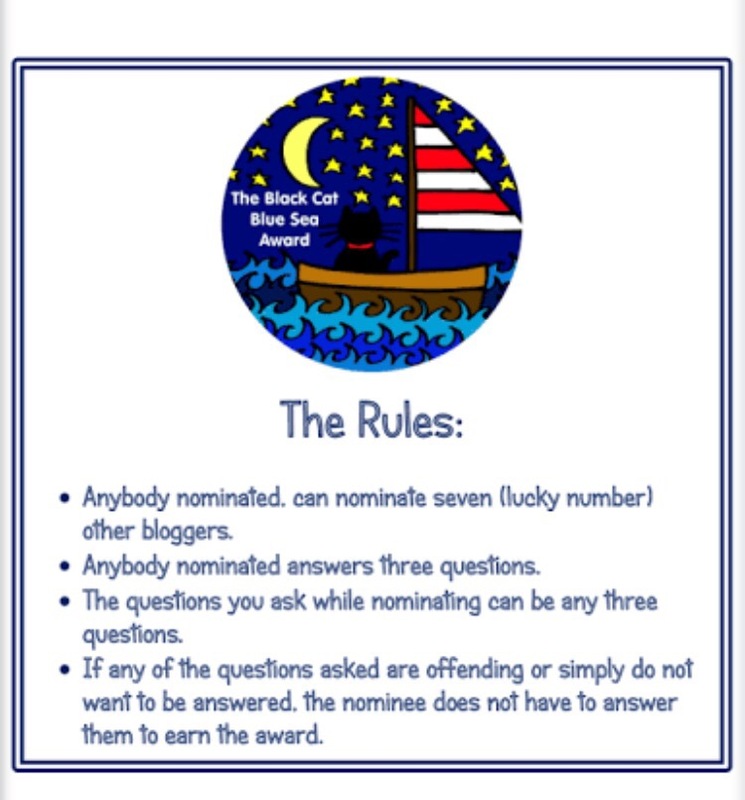 This weekend I found out that Faye, at The Chicken Grandma, nominated me for the Black Cat Blue Sea Award. Here’s something else I love, when I read what Faye said about the seven bloggers she nominated, I’m pretty sure my heart was beaming. My goodness, that’s incredibly kind. Thank you so much, Faye! This is interesting because I gave a Writer’s Wordshop to a homeschool group this week called, “Let’s Inspire Our Desire to Write.” I told them the best tool I have for coming up with writing ideas is my eyes. I usually see something first, and then the stories come. 2. What do you enjoy most about where you call home? Why? I love that there are lots of windows and wood floors in my home. When Little Bit is playing on the sidewalk, I always take lots of pictures of him through the doorways and windows. I love the sound the wood floor makes when he’s running up and down the hall in bare feet. 3. What is your favorite thing to do and with whom? I love to take drives with Little Bit. This week we said goodbye to summer and took some new gravel roads. We ended up in the middle of many Amish farms and even got to see little Amish children standing in their yard and waving at us. So fun. Normally, I’m don’t like to pick only a certain number of nominees because I don’t like leaving anyone out. Favorite memory of your parents or grandparents? Favorite recipe handed down to you? Thanks again, Faye. Being nominated is such a nice surprise. ← A is for Apples…and Applesauce! Congratulations on your nomination. Seeing Amish kids waving to you must be cute, incidentally. That was a fun ride. I thought we’d been on every road in this county, uh…not quite. We started venturing east and found lots of backroads I didn’t even know were there. Congrats Jess and thank you for the nomination. Thanks for including me sis! Some people are nit seeing my posts in reader. Are you? I may have to contact wordpress. I guess your seeing them ok, others not so much. Thanks for the feedback. I’m very happy for you! I appreciate your nomination, but I have decided to make my blog an award free zone. I hope you understand. However, that doesn’t mean I won’t keep cheering you on! Sounds like you had a wonderful start to fall this weekend. I love a good drive! I only wish we had more time for them! Congratulations and so very well deserved. Thank you Jessica. I am an award free blog too. I just don’t want to choose between my lovely blogging friends! I loved reading your answers. The comment about the wood floors bring back so many memories. I also have wood floors and when my boys were little their bare feet made the most wonderful “slapping” noise as they ran around. Oh!!! Thank you for sharing that! I can just picture them running about! :) Another favorite of mine right now is when Little Bit runs in and kicks off his shoes in the middle of the hall and there they sit, on the wood floor. That time comes before you even know it!!! I bet. I blinked and it was already 9 years.